Why Is Morganite so Popular? In the world of jewelry, it’s not uncommon to see particular gemstones go through fads of popularity. This is particularly true for stones that might not be as well-known as diamonds or the big three (emeralds, sapphires, and rubies). One stone that has become wildly popular in recent years is morganite, a relatively recent addition to the ranks of precious stones available for use in jewelry. If you’re unfamiliar with the stone, it isn’t hard to see why it has become a favorite. Morganite is a variety of beryl usually found in shades ranging from pale pink to light salmon. It was discovered in 1910 and was dubbed “morganite” in 1911 in honor of banker J.P. Morgan, who was also a famous gemstone collector. He donated thousands of specimens of extraordinary gemstones to the American Museum of Natural History in New York, so it seems only fitting that this gorgeous gemstone bears his name. 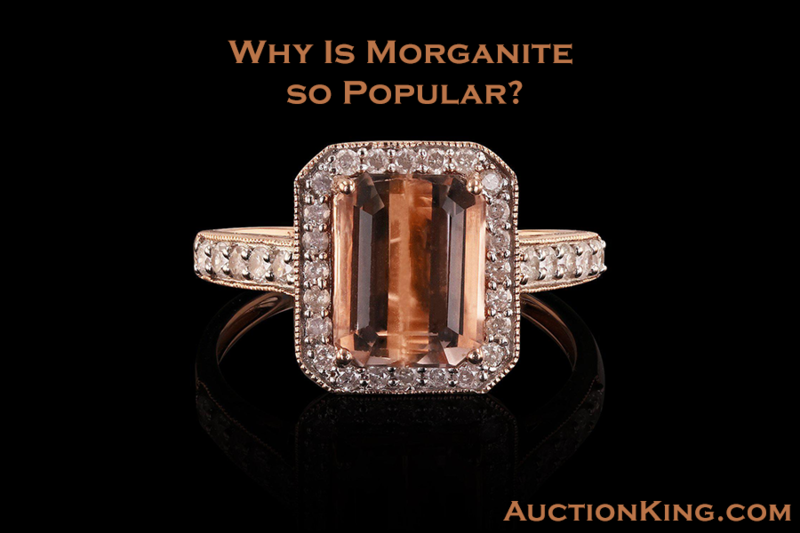 Morganite’s current popularity is probably due to a number of factors. First of all, it has a hardness of 7.5 on the Mohs scale, which means it is relatively resistant to scratches. This makes it suitable for all kinds of jewelry and for everyday wear. Second, its delicate pink hue is in line with current fashion trends, which has increased the demand. It looks especially good in rose gold settings, which are also highly sought after at the moment. In addition, unlike some colored stones, morganite can readily be found without eye-visible inclusions in larger sizes. This means that there is not a dramatic per-carat markup for larger stones, making it possible to find large faceted stones at reasonable prices. Given that larger morganites tend to exhibit stronger color, the ability to buy one without breaking the bank is a considerable attraction. One notable morganite trend is its use in engagement rings. Many brides looking for an alternative to a traditional diamond find morganite’s lovely color appealing. Compared to the cost for a similar-sized diamond, a large high-quality morganite can be quite affordable, although to get a truly superior stone you should still be prepared to spend a fair amount. However, it should be noted that you might want to think twice about following this trend if you are particularly hard on your hands—or you should at least plan to remove your ring before tackling tasks that might damage the stone. If you’re looking for morganite jewelry, Auction King’s authenticated selection of earrings, rings, pendants, and more is your source for superior quality pieces at below-market prices. Browse our continually updated inventory from the comfort of your own home, and bid with confidence on our secure proprietary bidding platform. Register today for a free online account to find your next treasure.